Allan Wicks, Noel Rawsthorne, Robert Joyce and John Scott were among the leading exponents who premiered Mathias’s considerable output for organ. 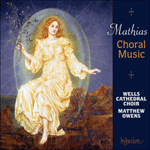 Processional—from OUP’s Modern Organ Music, volume 1 (1964) and dedicated to Mathias’s friend, publisher and editor Christopher Morris—is an effervescent, outrageously flamboyant piece. At just three minutes, it has a rhythmic fire and is intricate, at times meditative, and almost obtusely cross-rhythmed (to wonderful brusque effect, more like a Scandinavian toccata). Then half way through it seems to combine French influence, vibrant Britten and even florid Hindemith into an extraordinarily effective melee.